History research is dependent on the sources available, oral or written. 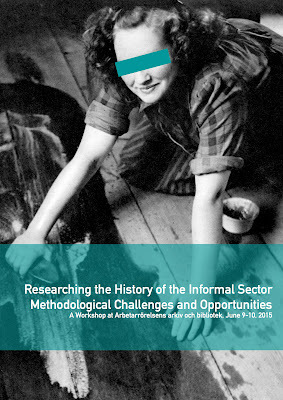 In Sweden, research on labour history usually relies on written documents from the archives. Our labour market has been formalized over the years; we have access to data from governmental bodies and protocols from union meetings. The high level of literacy among workers from quite early days gives us access to their thoughts and actions. But there are gaps in this material. Certain branches, where the unions were not so successful in organizing the workers, like household workers, or where the work force was always more temporary and unskilled, like dock workers, did not leave behind archive material in the same way as did branches heavily organized. And now, when the labour market in the industrialized world is becoming more informal, the rate of unionisation is dropping, these voices are less likely to be heard. Those are for instance employees of temporary work agencies, migrant workers (documented or undocumented) or foreign workers recruited for temporary work. How do we retrieve information on these sources, when they do not leave any written material behind? In the global south, our colleagues write on labour history with limited access to records and written sources. Written sources from their labour organizations are scarce. They have to rely heavily on oral history methods and other ways to collect and secure the source material needed for their research. This means that they have more experience from working as researchers on the informal sector of the economy. We need to learn from them. In order to discuss research on labour history using primarily oral methods, ARAB – Arbetarrörelsens arkiv och bibliotek (Labour Movement Archives and Library) hosts a two day workshop. The purpose of the meeting is to create a forum for in depth discussions on methods useful for researching working conditions on the informal sector of the labour market. In this way we would like to contribute to the development of research methods and methodology. The discussions will not only touch on the needs of research on these matters within humanities and social sciences, but also address the need of a change in approach among memory insti- tutions. The workshop will connect to resent research in archive science theory as well as ethical and methodological considerations when researching subordinate groups in society. The workshop is generously funded by Riksbankens Jubileumsfond. The working language will be English, and the meeting is open to researchers, stu- dents and labour activists. However, due to limited seats, registration is required. Email jonas.soderqvist@arbark.se for more information. Läs mer i arkivets kalendarium.